Red Pepper Egg in the Hole? 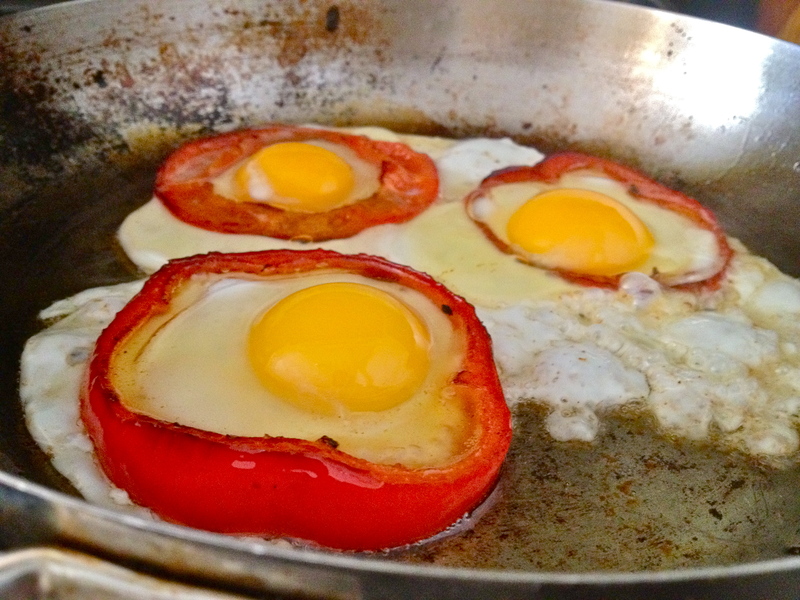 Egg in the Red Pepper Hole? Actually it’s more like Egg in and Around the Hole. I wasn’t sure what to call these. Basically it’s your standard egg in the hole, only instead of being in a hole, they’re in slices of red pepper. I love the shape of red pepper slices, and I was just struck with the idea to do this while I was making breakfast over the weekend. 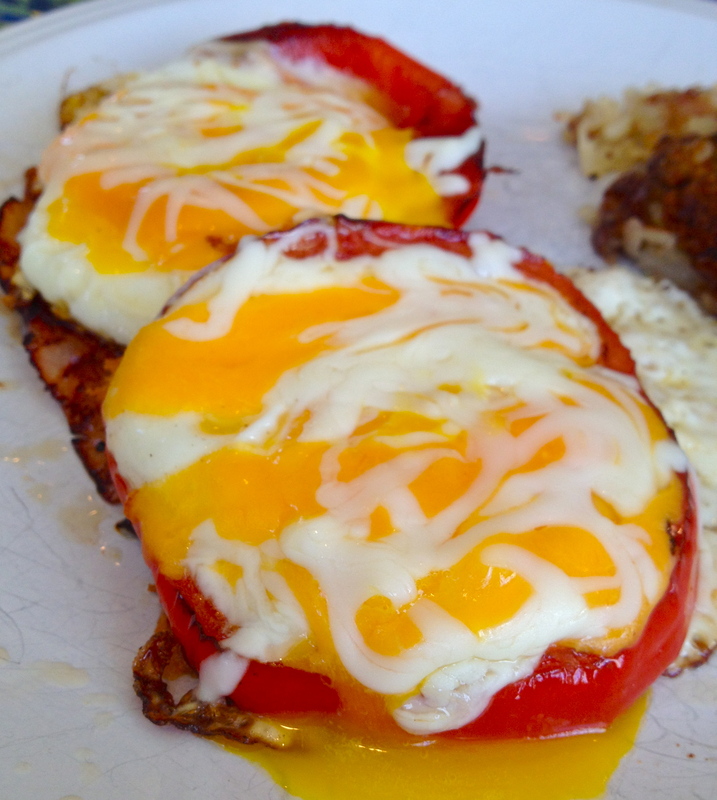 Eggs in the Pepper are really good for breakfast, and here’s why: They’re easy. They don’t have a lot of ingredients. They’re fast. And they feel fancy. Happy eating. 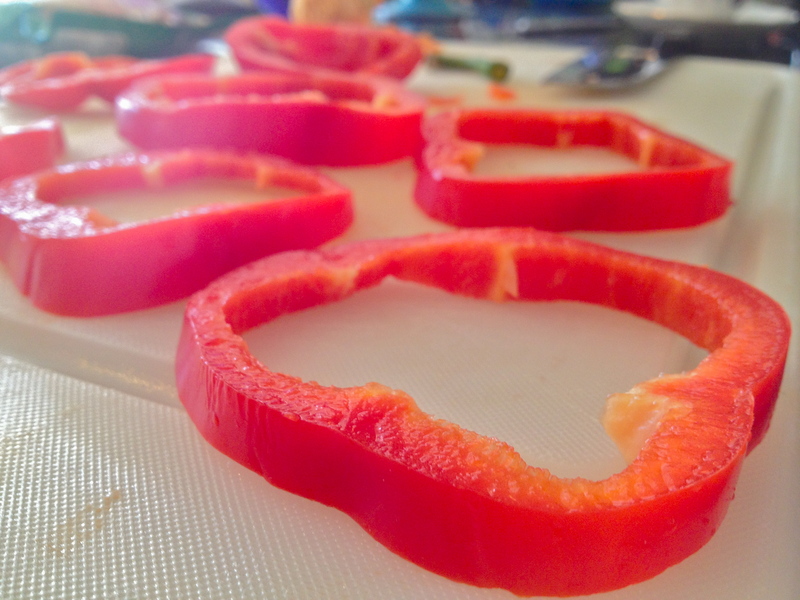 Lay the red pepper down horizontally and cut into 6 slices, cleaning out all the seeds and stuff inside. 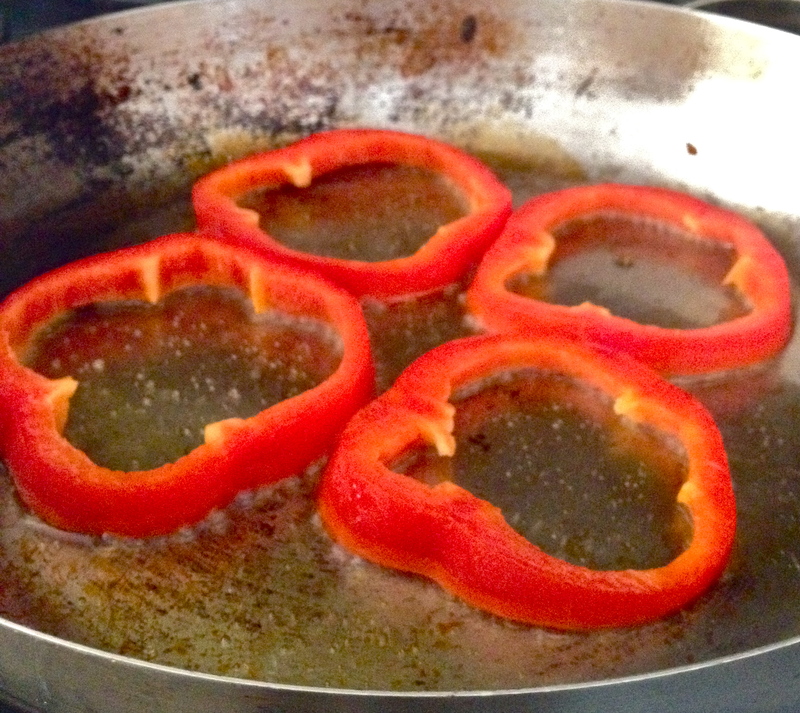 Heat oil in a pan and fry the peppers a few minutes on eat side, until tender and lightly browned. Work in two batches until they’re all cooked. 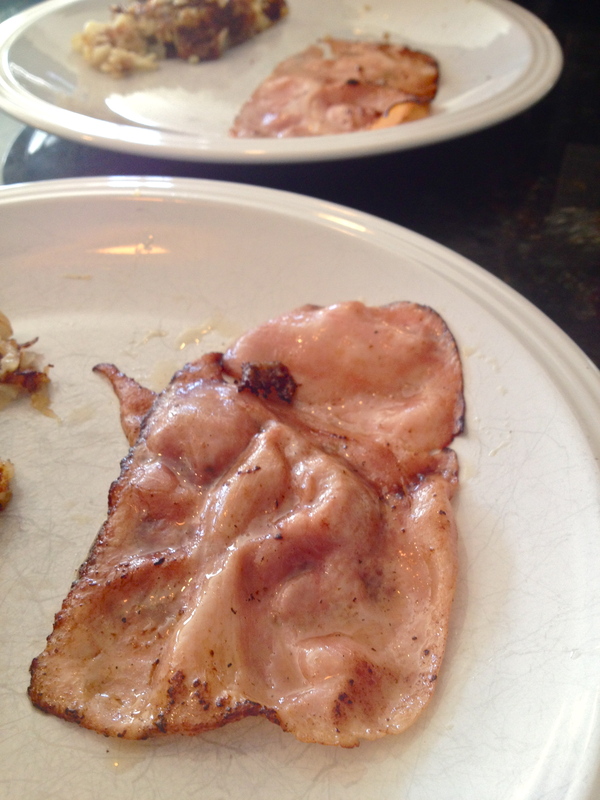 Then fry up the ham (or spinach instead, if you like). Just give it a minute or two on each side, and remove it to a plate. This will be the base for the peppers and eggs. Now put 3 of the cooked pepper slices back into the pan with some more oil. Crack 3 of the eggs into the middle of the peppers – no worries if some of the egg spills out the sides; it probably won’t be perfect. Cover the pan with a lid. 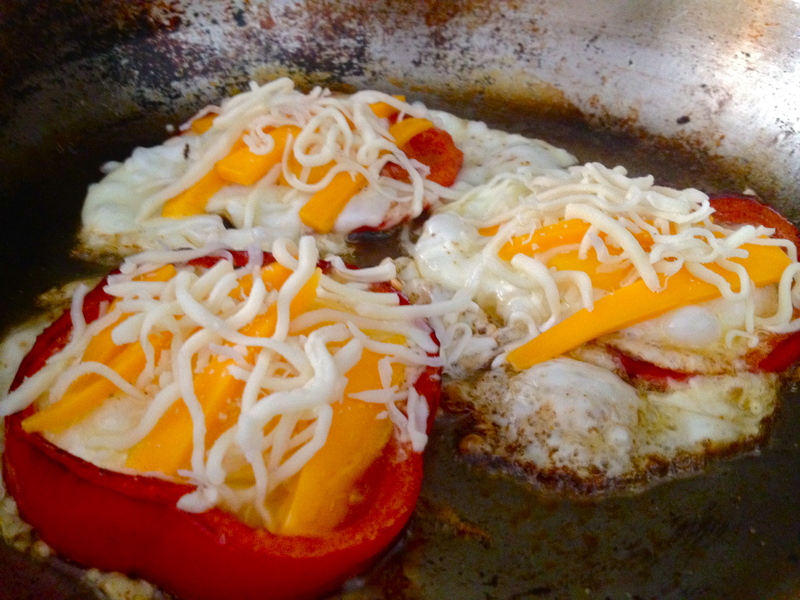 When the eggs are almost done, sprinkle some cheese on top and cover again to melt. Remove from heat and plate on top of ham or spinach. Repeat with the last 3 red pepper slices and eggs. 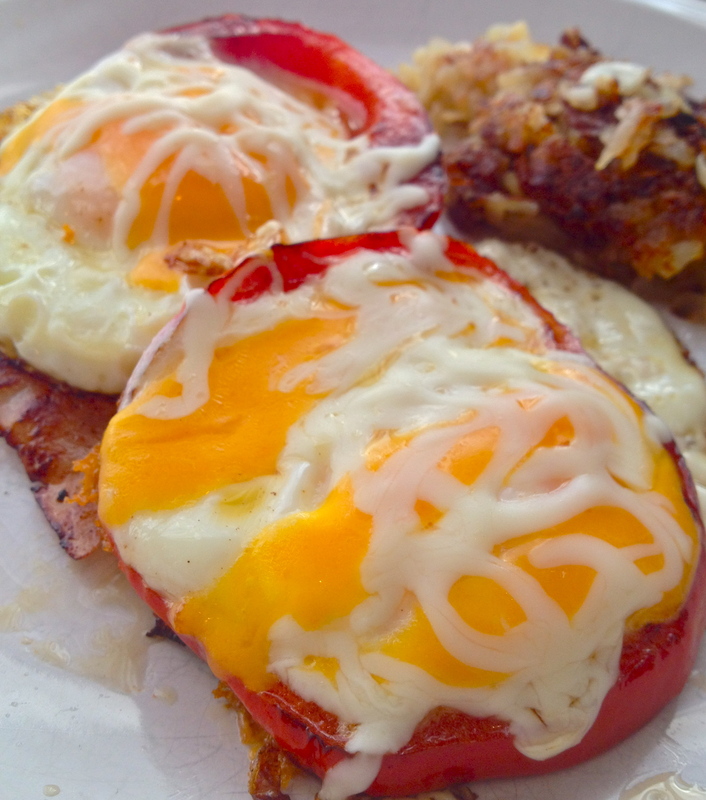 We served these with hash browns – such a great breakfast! Next Celery Root and Sweet Potato Soup. Can’t wait to try. It is so easy to prepare and full of ingredients that we love at our house. Thanks one more time, Kelly! Let’s make them together soon for a weekend morning breakfast! Thanks! They were :) I can’t wait to make them again! This looks amazing and makes so much sense. Thanks :) I think I want to try them with red, orange, yellow, and green peppers all at the same time, and get a little rainbow thing goin’. Such a fun dish! What a cool idea! I like the egg in the pepper. Something different for breakfast!